Iam not worried about the deficit,” Ronald Reagan once quipped on the campaign trail, “It is big enough to take care of itself.” That is a unique privilege enjoyed by United States – its trade deficit may breach the 2017 watermark of $552 billion, fiscal deficit is at over $800 billion and total debt is over $21 trillion. Thanks to the status of the dollar as the currency of last resort, it can fund and thrive despite the deficits and debt. India, like other countries, must shape up or slip into contagion and crisis. This Thursday, markets shrugged off optimism and embraced fear. Mercifully the price of Brent crude dipped from $86 per barrel to around $80, allowing the currency a breather rally to end the week around `73.50 for a dollar. The rupee’s weekend level, however, is scarcely stable and vulnerable to the petro puzzle. The trajectory of crude prices depends on geopolitics, conjecture about the impact of sanctions on Iran, and the economics of global growth, which determine the level of demand and thus pricing. Again, oil is just one of the threat factors. India’s current account deficit is also the result of earning in rupees and spending in dollars—of falling forex inflows and rising demand for dollars. Critically, the future course of the rupee’s value depends on how the trade tariff war plays out, the rising interest rates in the US, and the shift in preferences of investors. For India, as with any emerging economy, the slide in the value of the currency is a cascade of cause and consequence—in the financial markets and the broader real economy. The fall of the rupee triggers a flight to safety by investors, and this exodus exacerbates the slide in the value of the currency. Thanks to the turmoil, the Nifty50 has erased the gains of this calendar year. Bloomberg data estimates suggest foreign funds have taken out over `80,000 crore. Indeed, in the current calendar year, foreign portfolio investment has been negative in six of ten months. Data from NSDL shows FIIs brought over `2 lakh crore to invest in debt and equity in 2017. In 2018, the flow has reversed, leading to a net outflow of dollars. Meanwhile, there is no let-up in the need to pay for import of consumable goods, particularly electronics. This week the government hiked duties across a range of electronic and electrical items. At one level there is the fear of the impact on growth and employment, and at another level a rising anxiety about the adequacy of reserves to meet obligations to investors and for imports. The muddled narrative crafted by mandarins and deployed by politicos suggests India has adequate reserves. Technically India has reserves to cover imports for 10 months, which could be a comforting thought except that the road ahead is potholed with uncertainty. Data shows that between April and October, India has exhausted nearly $25 billion of its reserves even as the cost of the dollar rose from `65 to `74. Recent experiences of countries using reserves to defend currency have not ended well. The technical charts at the currency futures market reveal the currency sliding past `75 per dollar and the British Pound seems set to score a century. Evidently there is little political elbow room given the election season and scant financial headroom in the reserves to attempt to defend the currency. The government could sit tight and hope for the Iran barter deal to come through and trade wars to abate, but hope is scarcely a strategy. History reveals that twice in two decades India has raised dollars, once through a sovereign bond during NDA I and once through a scheme for NRIs which raised $34 billion to boost the reserves. Unsurprisingly, there is speculation about the government tapping NRIs to raise dollars through a sovereign bond or designing yet another scheme to woo NRIs and overseas Indians to invest in a sovereign bond. In the post-war era, the British National Savings Banks Account tapped into public sentiment with a distinctly American catchphrase—Put your money where your mouth is. It has been frequently argued that the view on India is now “modified”. 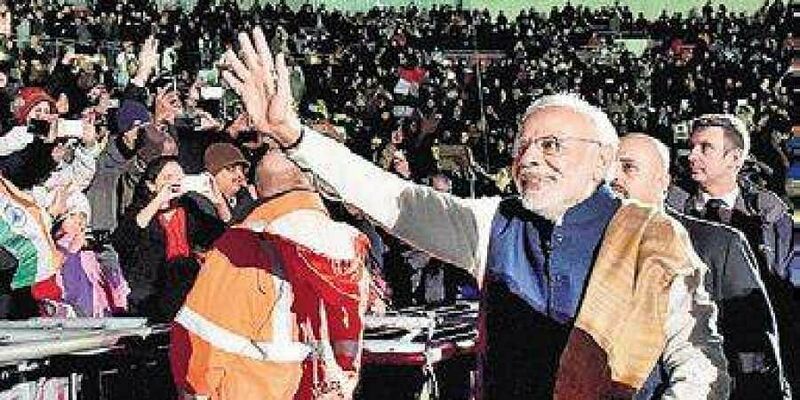 Prime Minister Narendra Modi has been welcomed by rousing rallies at Wembley, Madison Square Garden, San Jose, MCG Melbourne, Shanghai and Dubai. Arguably, the diaspora could (as evangelists did in 1880s) be asked to put their money where their faith is, where their heart is and invest in the pride of India. For some years now, Indians’ affections for achievers of Indian origin have rested on a kind of Pareto-optimality. Their success is appropriated for free in exchange for mass adulation. Perhaps it is time to approach the marquee of high-fliers for a return on emotional equity. The bond would need to be smartly designed. Context is critical and 2018 is not 2013. Then the world was awash with money, interest rates were negative or barely above zero. The withdrawal of money by central bankers affects supply, and the market conditions daunt demand for such a bond. The terms of endearment will need to be much more attractive and the costs will be higher. The 2013 effort was described as an NRI scheme but was essentially a leverage opportunity for banks. This must change. Why not expand the ambit to offer the opportunity to offer an open-ended bond that can be listed and is tradeable after three years? It makes sense to expand the footprint across the 21 million-strong diaspora, allow a kind of SIP for those toiling abroad, those willing to lend to relatives in India—for marriage, property or educating a sibling or a relative.